The purpose of this document is to define a “fiber optic datalink,” its purpose, design and performance. It is intended to provide guidance for the designer of datalinks or communications systems and the installer of fiber optic systems who must verify the performance of the datalink including the cable plant installed for its operation. A fiber optic datalink is a communications subsystem that connects inputs and outputs (I/O) from electronic subsystems and transmits those signals over optical fiber. In this function, a fiber optic datalink operates as an alternative to copper cabling or a wireless subsystem. In typical applications, a fiber optic datalink acts as a communications medium attached to electronics on either end that provide the other services necessary for communications over the link. In the OSI (Open Systems Interconnection) Network Model, the datalink is basically the first layer, called the Physical Layer or PHY. A fiber optic datalink consists of fiber optic transceivers or individual transmitters and receivers at either end that transmit over optical fibers. In operation, the fiber optic datalink gets an electrical pulse input from an electronic system. 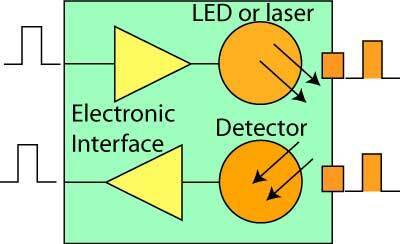 In the transmitter, a source driver sends current through a source, typically a laser but sometimes a LED, which creates a pulse of light. The pulse of light from the source is coupled into an optical fiber that is part of a fiber optic cable plant. The pulse travels down the fiber where it is attenuated by the fiber and suffers loss from fiber joints created by splices or connections. At the receiver, the light pulse is converted to an electrical pulse by a photodetector, amplified by the receiver circuitry and converted to an electrical pulse compatible with the communications equipment it connects. Fiber optic datalinks may transmit signals that are either analog or digital and of many different, usually standardized, protocols, depending on the communications system(s) it supports. Datalinks may be protocol transparent but may also include data encoding to provide more robust data communications. Datalinks may be specified by the application or standardized network (e.g. Ethernet) they are intended to support or by the types and bandwidth of signals they are designed to transmit. The typical datalink transmits over two fibers for full duplex links, one fiber in each direction. The fibers may be of any type, multimode (graded index or step index) or singlemode. Some links may use couplers and wavelength-division multiplexing to transmit bi-directionally over a single fiber as in FTTH PONs passive optical networks or OLANs, optical LANs. Some links may allow transmission at several wavelengths of light simultaneously over a single fiber in each direction, called wavelength-division multiplexing. Extremely long cable plant lengths may require regeneration using repeaters, essentially datalinks in series. Optical fiber amplifiers may be used as repeaters in long singlemode systems. Singlemode systems using fiber amplifiers and wavelength-division multiplexing may require concern for nonlinear effects from high optical power involved. Analog signals are continuously variable signals where the information in the signal is contained in the amplitude of the signal over time. 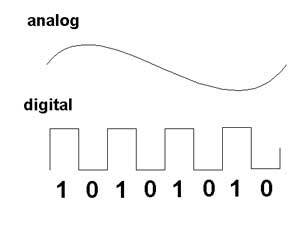 Digital signals are sampled at regular time intervals and the amplitude converted to digital bytes so the information is a digital number. Analog signals are the natural form of most data, but are subject to degradation by noise in the transmission system. As an analog signal is attenuated in a cable, the signal to noise ratio becomes worse so the quality of the signal degrades. Digital signals can be transmitted long distances without degradation as the signal is less sensitive to noise. Fiber optic datalinks can be either analog or digital in nature, although most are digital. Both have some common critical parameters and some major differences. For both, the optical loss margin or power budget is most important. This is determined by connecting the link up with an adjustable attenuator in the cable plant and varying the loss between transmitter and receiver until one can generate the curve shown above. Analog datalinks will be tested for signal to noise ratio to determine link margin, while digital links use bit error rate as a measure of performance. Both links require testing over the full bandwidth specified for operation, but most data links are now specified for a specific network application, like AM CATV or RGB color monitors for analog links and SONET, Ethernet or Fibre Channel for digital links. A fiber optic transceiver used on each end of a link includes a transmitter and receiver that convert electrical signals to optical signals and vice versa for transmission over optical fiber. Appropriate interfaces are included in the datalink to mate with the electrical and optical signals it connects with. These are typically standardized electrical and fiber optic connectors. The transmitter consists of an electrical input and signal conditioning circuitry to drive an optical source, a light-emitting diode or laser that provides the electrical to optical conversion and alignment hardware for coupling of the optical signal into an optical fiber for transmission. The receiver consists of a detector that connects to the optical fiber to accept an optical signal, convert the optical signal that has been transmitted through the optical fiber to an electrical signal and conditioning circuitry that creates an electrical output compatible with the communications system. Transceivers are dedicated to one type of fiber determined by the distance and bandwidth of the communications being transmitted. Multimode fiber may be used for shorter and/or slower datalinks while singlemode fiber is used for longer links. The source in the transceiver will also depend on the application. LEDs are used for slower (<~100 Mb/s) multimode links and VCSELs are used for faster multimode links. Some standard networks have options for using singlemode 1310nm lasers on multimode fiber. There are currently four types of multimode fiber used for datalinks, designated OM1-4. OM-1 is a fiber with larger core (62.5 microns) used primarily in legacy systems with LEDs at 850 or 1300 nm wavelengths. Faster multimode links use OM-2, OM-3 or OM-4 fiber with a 50 micron core, generally the faster fibers designated OM-3 or OM-4 which are optimized for 850 nm VCSELs. Singlemode systems use lasers at 1310 or ~1550nm. 1310nm lasers are used for shorter links. The longer wavelengths around 1550 nm are used for long links and those using wavelength-division multiplexing. There are several specialized singlemode fibers which are optimized for special applications. All datalinks are limited by the power budget of the link. The power budget is the difference between the output power of the transmitter and the input power requirements of the receiver. The receiver has an operating range determined by the signal-to-noise ratio (S/N) in the receiver. The S/N ratio is generally quoted for analog links while the bit-error-rate (BER) is used for digital links. BER is practically an inverse function of S/N. The operating range of a data link will look like the graph above. There must be a minimum power at the receiver to provide an acceptable S/N or BER. As the power increases, the BER or S/N improves until the signal becomes so high it overloads the receiver and receiver performance degrades rapidly. 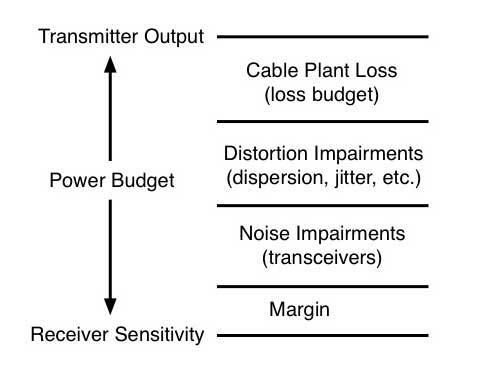 The power of the receiver is determined by the output power of the transmitter diminished by the loss in the cable plant primarily but other factors may affect power budget performance. When the power budget is inadequate for the loss in the cable plant, higher power transmitters or more sensitive receivers or higher bandwidth cable plant are required. Contributions to link power budget. Transceivers may be components intended to be built into electronic subsystems to create communications equipment. Standalone transceivers may be sold as media converters to convert signals from electrical on copper cabling to fiber optics. Built-in transceivers are generally powered by the communications equipment in which they are installed. Media converters are powered by separate sources of electrical power. 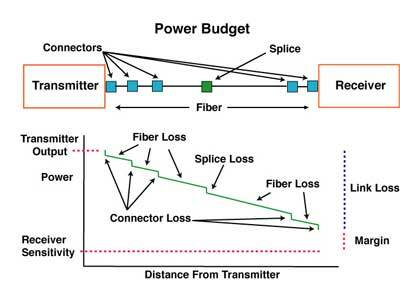 More on power budgets and the similar "loss budget" which is the estimate of fiber optic cable plant loss. A fiber optic datalink transmits signals as pulses or varying light over optical fibers that are included in a fiber optic cable plant. The permanently installed cable plant consists of an optical fiber cable designed to protect the fibers, which is installed, spliced and terminated with proper hardware to mate with the datalink transceivers. The cable plant must be selected and installed to withstand the environment in which it is installed. The cable plant is typically terminated at outlets or patch panels near the communications equipment. The installed cable plant is typically connected to the transceivers by short patchcords. The fiber optic cable plant must be compatible with the performance parameters of the transceivers for the link to operate properly. This includes types of fiber and connectors, optical loss and bandwidth of the cable plant. For the cable plant, a loss budget must be calculated to estimate its loss and a power budget to determine if the planned communications system will operate over the cable plant. Fiber polarity is important for design and documentation. Since the transmitter must be connected to the receiver for the link to operate, there must be a crossover in the fiber pair at some point in the cable plant. Generally, the permanent cable plant is installed straight through, with fiber 1 connected to fiber 1 on each end, and so forth. Since the link requires one crossover, that is accomplished by a crossover patch cord on one end of the link. The location of crossover patchcords should be limited to one area, e.g. the main equipment room, so all duplex patch cords at that location are crossover cables while straight through cables are used at all other locations. The factors that determine the required performance parameters for a fiber optic datalink are those that define the communications signals to be carried on the link (the data bitrate (digital transmission) or bandwidth (analog transmission) at which the link operates), the length of the link and the specifications (bandwidth and optical loss) of the fiber optic cable plant. These factors determine the types of transceivers and cable plant components that must be chosen for a communications system. The two major factors of concern in link design and testing after installation are the loss of the cable plant and the bandwidth. The loss of the cable plant is determined by the summation of the loss in the cable plant due to fiber attenuation, splice loss and connector loss. In some cases the fiber attenuation may be increased by improper installation of the cable. As a signal travels down the fiber, the signal will be attenuated by the optical fiber and reduced by the loss in connectors and splices. For each cable plant designed, one must calculate a loss budget. The loss budget estimates the loss of the fiber in the cable plant by multiplying the length (km) by the attenuation coefficient (dB/km), then adding the loss from connectors and/or splices determined by the number of connectors and/or splices times the estimated loss each to get the total estimated loss of the cable plant. The cable plant loss budget must be lower than the power budget of the link transceivers (see below) for the link to work properly. Dispersion or pulse spreading limits the bandwidth of the link. Transceivers have some dispersion caused by the limitations of the electronics and electro-optical components but most of the dispersion comes from the limited bandwidth of the fiber in the cable plant. Dispersion in multimode optical fiber occurs by modal dispersion or chromatic dispersion. Modal dispersion is caused by the different velocities of the various modes being transmitted in the fiber. Chromatic dispersion is caused by the different velocities of light at different wavelengths. Singlemode fiber also causes dispersion, but generally only in very long links. Chromatic dispersion has the same cause as multimode fiber, the differences in the speed of light at different wavelengths. Singlemode fiber may also suffer from polarization-mode dispersion causes by the different speeds of polarized light in the fibers. The transceiver must be chosen to provide proper performance for the communications system’s requirements for bandwidth or bitrate and to provide an optical transmitter output of sufficient power and receiver of adequate sensitivity to operate over the optical loss caused by the cable plant of the communications system. The difference in the transmitter output and receiver sensitivity defines the optical power budget of the link. The cable plant components, optical fiber, splices and connectors, are chosen to allow sufficient distance and bandwidth performance with the transceivers to meet the communications system’s optical power budget requirements. The power budget of the link defines the maximum loss budget for the cable plant. The maximum link length will be determined by the power budget and loss budget for low bit rate links that will be derated for dispersion for higher bandwidth links. Most standardized communications systems will specify the performance of the components including interfaces to the electronic I/O and types of fiber supported for various distances. Systems standards may also include specifications for fiber optic connector type, primarily at the transceiver. Most communications systems with short links have options for both multimode and singlemode fiber while longer links use only singlemode fiber. All networks may provide guidance as to the types or grades of fiber needed to support certain applications. Every manufacturer of datalinks components and systems specifies their link for receiver sensitivity (perhaps a minimum power required) and minimum power coupled into the fiber from the source. Typical values for these parameters are shown in the table below. In order for a manufacturer or system designer to test them properly, it is necessary to know the test conditions. For data link components, that includes input data frequency or bitrate and duty cycle, power supply voltages and the type of fiber coupled to the source. For systems, it will be the diagnostic software needed by the system. Within the world of datacommunications links and networks, there are many vendor-specific fiber optic systems, but there are also a number of industry standard networks such as Ethernet which have fiber optic standards. These networks have agreed upon specifications common to all manufacturers' products to insure interoperability. This page in FOA Tech Topics shows a summary of specifications for many of these systems. During the design and manufacturing process, datalinks are tested for proper transmission over specified distances for optical loss and bandwidth. 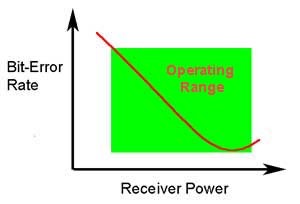 Loss testing is done by transmitting through a variable optical attenuator over short lengths of fiber (to eliminate dispersion effects) to create a diagram of bit error rate (BER) vs received optical power (or signal-to-noise ratio, SNR, the inverse of BER) which shows the range of optical loss the transmitter/receiver pair can operate over. In the drawing above, the link has a lower BER as the optical power increases since the S/N ratio improves. This generally continues until the receiver power becomes too high and the receiver overloads. If the transmitter power is high and the cable plant loss low, it is possible in some systems to overload the receiver. In that case an optical attenuator should be used at the receiver to lower power to acceptable levels. 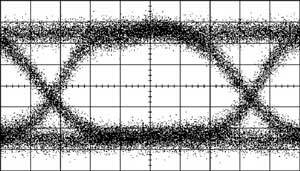 Bandwidth testing is generally done by bit error rate testing or examining “eye diagrams” of signals for dispersion. The most common way to overcome dispersion effects is to increase optical power at the receiver by reducing the length of the cable plant and/or lowering the loss budget of the cable plant. This type of testing will provide specifications for the datalink as to the types of fiber required and the loss budget of the link. It is those specifications that will determine the use of the datalink in a communications system design and what performance parameters will need testing after installation. Testing installed datalinks includes testing the cable plant first then testing the operation of the datalink transceivers over the cable plant. The cable plant will be tested after installation to ensure the installation was done properly before the communications system is installed and tested. Short singlemode cable plants are also tested for loss only, but long distance high bitrate singlemode systems may also require testing the cable plant for bandwidth, e.g. chromatic dispersion and polarization mode dispersion. Short links may also have problems with reflectance from connectors, so special non-reflective APC style connectors are usually specified since reflectance testing can be difficult. Testing the operation of the transceivers with the cable plant includes optical power testing of the output of the transmitter and the receiver input power compared to specifications for the link. After the datalink or communications system is installed, testing the BER or SNR of the complete communications link may be done to confirm that the link is operating properly. FOA Standards for testing cable plant loss and optical power can be used to properly specify test requirements. After you study this page and "More on fiber optic transceivers and their components" you should test your comprehension here.